Each year the Margaret Angus Research Fellow is selected by the Museum from a pool of qualified applicants. The appointed Fellow spends the duration of the four-month program researching and preparing a manuscript reflecting the history of health and health care as expressed by components of the Museum's collection. Each year, usually in autumn, the paper is presented by the Fellow to an audience at the Museum, to the delight of the public and professionals alike. The Museum of Health Care is privileged to have our Research Fellowship named after Dr. Margaret Angus. Dr. Angus' historical publications and contributions to the heritage community have been recognized throughout Canada. 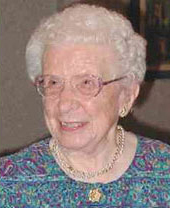 Dr. Angus died on February 15, 2008, a few months shy of her 100th birthday. If you care to make a donation to our fellowship in honour of Dr. Angus, please contact the Museum or donate online. Applications are now being accepted for the 2018 Margaret Angus Research Fellowship. Please view the posting details here. To receive a notification of future postings, please subscribe to the Museum's Bailliebytes E-Newsletter. View topics of current interest to the museum. The manuscripts produced are available as research resources in the Museum. Below are the former research fellows, their projects, and resources available online. 2016 Frederick Banting, a Man of Insulin: Discovering a Human within a Hero by Natalie Mukhina. View the 2016 Research Fellow manuscript. 2015 Prisoners or Patients? Exploring Curative Labour in Kingston's 19th-Century Penitentiary and Asylum by Madeleine McKay. 2014 Borrowed Remedies and Hidden Histories by Rebecca Benson. View the 2014 Research Fellow manuscript. 2013 Half the Battle: War and the Public Health Revolution by Robert Engen. View the 2013 Research Fellowship manuscript. View the 2013 Research Fellowship Evening Presentation. Read the 2013 Research Fellow's blog series. 2012 Cultures of Birth. Midwifery in 19th- and 20th-century Ontario by Diana Gore View the 2012 Research Fellowship Evening Presentation. 2011 Spare Parts: How Crippled Masculinity Got Hamstringed & Got a Leg-Up by Jeff Sobil. View the 2011 Research Fellowship Evening Presention. 2010 Torture or Treatment: Electroconvulsive Therapy by Sarah Xiao. View the abstract. View the 2010 Research Fellowship manuscript. View the 2010 Research Fellowship Evening Presentation. 2009 From Laboratory Instrument to Powerful Diagnostic Tool: The Impact of the Electrocardiogram on the Clinical Diagnosis of Heart Disease, 1900-1970 by Leanne Shapton. View the abstract. View the 2009 Research Fellowship manuscript. View the 2009 Research Fellowship Evening Presentation. 2008 Badges of Honour or Devices of Control? : Uniforms at Kingston General Hospital Training School for Nurses, 1930-1970 by Andrea Melvin. วิธี สุ่ม แจ๊ ค พอ ต สล็อตView the abstract. View the 2008 Research Fellowship manuscript. View the 2008 Research Fellowship Evening Presentation. 2007 The Malleability of Wax and Meaning: Marjorie Winslow and Twentieth-Century Moulage Production in Canada by Andrea Terry. View the abstract. View the 2007 Research Fellowship manuscript. View our Cabinet of Curiosities exhibit on moulage. 2006 Dr. John G. Fitzgerald: Canada's Public Health Care Visionary by Jennifer Lem. View the 2006 Research Fellowship manuscript. 2005 Protecting our Privates; Military Health Education and the VD Epidemic by Christopher Webb. View the abstract. View the 2005 Research Fellowship manuscript. 2004 A Blessing to the Neighbourhood at Large': Dr. Kenneth Fenwick and late 19th-Century Surgery by Jennifer Walker. View the 2004 Research Fellowship manuscript. Download our mobile app Transformation of the Kingston General Hospital or take our self-guided tour The Astonishing Past of KGH and see the late-Victorian operating amphitheatre that Fenwick pushed for and in which he received his fatal infection! 2003 Snake Oil and Mothers' Milk: The representation of woman in Victorian patent medicine advertising trade cards by Phaedra Livingstone. View the abstract. View the 2003 Research Fellowship manuscript. View our online exhibit on trade cards. 2002 Confining for Cure: A History of the Early Sanatorium Era in the Treatment of Pulmonary Tuberculosis in Ontario: 1896 - 1918 by Lauren Furness. View the 2002 Research Fellowship manuscript. 2001 Plants in the Development of Modern Medicine by Viviane Paquin. View the 2001 Research Fellowship manuscript. Visit our related online exhibit the Healing Power of Plants. 2000 The History of the No.7 Canadian General Hospital by David Kasserra View the 2000 Research Fellowship manuscript. 1999 The History of Prosthetic Joint Replacement by Daniel Sipes. View the 1999 Research Fellowship manuscript. Visit our online exhibit Joint Replacement. 1998 Development of the Cardiopulmonary By-Pass Machine by Daniel Sipes. View the 1998 Research Fellowship manuscript. View a summary of our past exhibit on this topic. 1997 Beyond Ether - 150 Years of Anaesthesia by Elaine Berman. “The Margaret Angus Research Fellowship has been the single most important academic learning experience I have had to date. As a largely self-driven project, my summer research entailed significantly more self-directed learning and scheduling than I had been exposed to previously. This facilitated the opportunity to dive into areas of interest as they arose, and enabled me to be flexible with my expectations throughout the summer. I value many of the lessons this research taught me, most notably that using other researcher's prior work can help springboard new ideas and save much of the time and labour involved in collecting primary data. My respect for medical history has grown tremendously through this work, and I look forward to continuing research in the field of medical history. Culminating the Fellowship with a public lecture was both rewarding and inspiring, providing me an opportunity to share my work and hear new ideas about the Spanish Influenza that I had previously not known."